Anthony and Michelle Johnson and their children in front of the two-flat in the 700 block of North Spaulding Avenue that they purchased through the city's Micro Market Recovery Program (MMRP). They live in the lower portions of the house and rent out the top floor. In 2012, Jeannie Oquendo believed a “dirty, unorganized” block in West Humboldt Park could become something special a few years later. Oquendo in 2015 became the first homeowner in the 500 block of North Central Park Avenue after six vacant properties were acquired through the City of Chicago’s Micro Market Recovery Program (MMRP). All of the buildings are now occupied, three with first-time homebuyers – the block has bloomed. Oquendo also owns a side lot next to her home, purchased in 2016, that this year was filled by a garden packed with tomatoes, cucumbers, jalapeno peppers and other vegetables. Local Initiatives Support Corporation (LISC) Chicago coordinates the work of community organizations across the city who inventory vacant and foreclosed properties in target areas, identify owners of troubled properties and present recommendations to City officials and technical assistance providers. The MMRP provides $15,000 in purchase assistance to income qualified homebuyers toward the purchase of a single-family to 4-unit homes listed on the private market. In addition, vacant, foreclosed or a short-sale 1-4 unit building will qualify for MMRP purchase assistance. As part of the MMRP, the Johnson family – Anthony, Michelle and their two young children – purchased a two-flat in the 700 block of North Spaulding Avenue also in West Humboldt Park. They live in the lower portions of the house and rent the top floor. The home had been vacant for more than a year, and the Johnsons moved in after the home was completely renovated. “We love it,” said Michelle Johnson, who like her husband, teaches tuckpointing skills to local teens. Jeannie Oquendo in 2015 became the first home owner in the 500 block of North Central Park Avenue after six vacant properties were acquired through the MMRP. All of the buildings are now occupied, three with first-time homebuyers. The MMRP started in 2011 as an initiative by the City of Chicago to respond to homeowner foreclosure crisis and its impact on neighborhoods, said LISC MMRP coordinator Jack Swenson. From 2012-16, the City worked with LISC to identify 13 Neighborhood Target Areas on the South and West sides – including Chicago Lawn, Englewood, Austin and West Humboldt Park — for the MMRP where the housing market could not come back on its own. The program is continuing in six of those sections, including where Oquendo and the Johnson family live, plus added three more target areas in 2017, Swenson said. 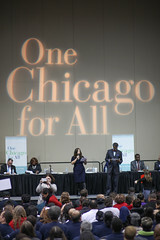 David Reifman, Commissioner of the Department of Planning and Development for the City of Chicago said the city has “tried to connect our MMRP strategy to a larger community and economic development strategy. To date, Swenson said MMRP has reoccupied 865 vacant properties, saved 76 people from foreclosure, reduced the cost of home ownership for 306 families and counseled 910 people on housing-related issues. The key to this success is working through local organizations that know the community and have deep relationships with local residents, according to Swenson, and starting small – showing progress on a few key blocks as a way to trigger bigger impact. Oquendo, a Prosser High School and DePaul University graduate, said she was happy to be her block’s trailblazer. The program allowed her to purchase the red brick home and fully rehab it. The process took more than two years, but she said it was worth it as she owns a home for the first time and has a place for her three children. She wanted to live and own in West Humboldt Park because her parents live a few blocks away and she wanted to be close to the CTA Green Line, which she utilizes to travel to schools across the city for her position as a bilingual educator for the YWCA of Metropolitan Chicago. For more information on the MMRP check out this video or these City of Chicago details.